You have lots of options for tooth replacement these days. Dentures and partial dentures, fixed dental bridges, and dental implants are the three basic types, and within these options are variations – you can opt for an implant-supported denture or a bridge anchored by dental implants if you’re missing several teeth in a row. This is why dental implants are such a great option for tooth replacement from Feigenbaum Dental in Creve Coeur, MO. They offer a great deal of versatility, fixing all manner of tooth loss problems and fitting in with your lifestyle while offering a great deal of stability and strength. If you’re missing teeth, you may be overwhelmed thinking about your options, but a trip to Feigenbaum Dental can help you learn more and make a great decision for your smile. Your natural teeth have two parts: the crown and the root. When you lose a tooth, you lose the tooth root, and this signals your jawbone that it no longer needs to provide support to a tooth. Your jawbone begins to deteriorate, and over time this will cause all kinds of problems with remaining teeth and tooth replacement – at least, if you don’t select dental implants. Dental implants replace tooth roots as well as the crowns, which means no jawbone deterioration and greater long-term post-tooth loss oral health. You’ll find that your smile is sturdier and more comfortable, and your facial shape won’t change over time, which can lead to droopy, saggy muscles and more wrinkles. Overall, dental implants are the more natural-looking tooth replacement option and offer a greater number of benefits than other types of tooth replacement. 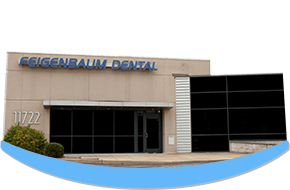 The benefits of choosing dental implants from Feigenbaum Dental in Creve Coeur, MO are numerous. Dental implants offer a high success rate of between 95 and 98%, do not require the modification of remaining teeth, support jawbone health, and offer greater confidence in your tooth replacement. With dental implants, we can secure a denture or a dental bridge. Your oral hygiene routine will remain the same, making the impact on your lifestyle minimal. And you’ll feel freer to live your life fully, knowing that dental implants are providing strength, durability, reliability, and security. Implant-supported dentures and partials rely on the placement of a couple of strategic dental implants, which either support a bar or have special posts designed to snap into your denture or partial. This means that your denture or partial is still removable, but when you snap it into place it fits securely and stays put. One of the main concerns most people have when wearing dentures and partials is that they can come loose, causing embarrassing slipping and clacking. Instead, implant-supported dentures and partials offer an alternative that’s stable and improves confidence.